Whilst design is not critical in any communication strategy, it can be useful in supporting campaigns that rely heavily on good communication. We have a talented team that understands business communications, and the strategies that make for successful projects. We have skills to create simple to complex presentations. We have the skills to put literature together (though we don't print). We have the skills to produce business video, multimedia and develop websites. And we have people with director level skills, as well as people with audio editing skills, who, together, have formed what have been some truly awesome presentations. 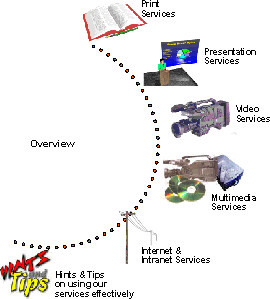 One of our greatest strengths is that we can offer a 'network' of graphics services. We aim to deliver one of the best media production services available: we want to be among the elite. To achieve this we need a strong base to work from. Graphics is the core of our business and is the fountain from which all of our services emanate. On its own it serves little use, but as a base to the remainder of our services it provides the power to deliver work that is rivalled only by top end specialist studios. But we are not a specialist studio. We hope we are providing this degree of service through all our services. Currently the stronghold of our services, print design is catered for in countless ways. An infinite variety of layouts, with diagrams, tables, schematics, graphics, and digital photography, can easily be put together. We can import data from almost any database, spreadsheet or wordprocessor - certainly the standard ones. We aim our services at corporate clients so a strong emphasis is made on maintaining corporate identity. We specialise in communications graphics - solutions that have something to say in their own right. We cater for presentation in a number of ways. By calling on both our print design techniques and video resources we can put together any form of presentation whether it is based on OHP's, 35mm slides, on-screen shows, through to multimedia or even a full blown seminar class presentation. It may (or may not) include text, graphics, animations, voice-overs, video, atmospheric sounds, backgrounds, etc., etc. We can advise on how to design such events from the basic to the advanced. The service caters for an entire range of formats from Broadcast Quality right down to commercial and domestic video. There is also the option of putting the entire project on CDi. Our computerised animation systems offer a precision and flexibility only rivalled by big 'transputers' and at a fraction of the cost. Currently the ultimate in presentation technology, multimedia, as well as offering combined media, offers its audience a range of choices to access to a variety of information and programmes as required. Imagine the possibilities of books and video brought together in one unit and then imagine multiplying this over a number of choices. Multimedia can certainly offer a wonderful service to entertainment. As the Internet spins its web more and more companies are taking up the opportunities it provides. Many are using it as an advertising gimmick whilst most use it as an information database for potential clients to review the services of that company and to release a variety of information to the public.